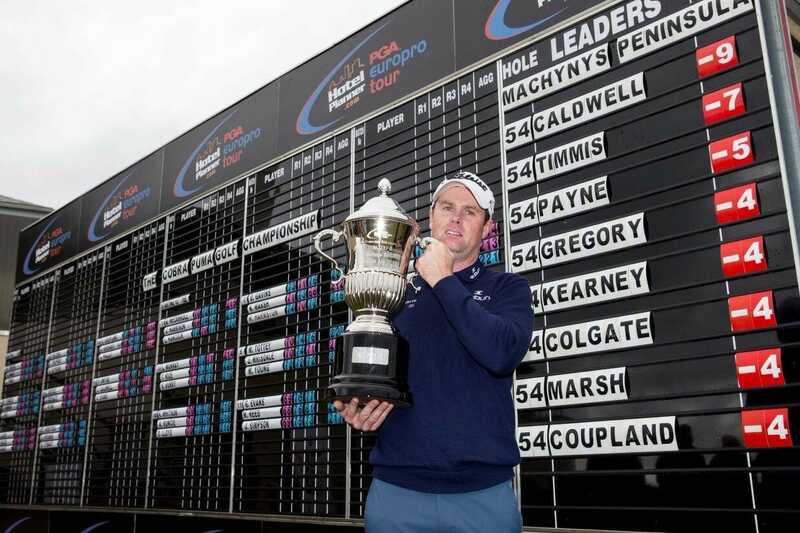 Jonathan Caldwell carded a final-round 69 to win the COBRA PUMA GOLF Championship by two shots on nine under par on a wet and windy day at Machynys Peninsula Golf Club in Llanelli. The HotelPlanner.com PGA EuroPro Tour event was suspended for 1 hour 45 minutes in the early stages of the final round due to heavy and persistent rain causing standing water on the course. At that stage Caldwell (Clandeboye Golf Club) led on seven under par, with overnight leader Chris Evans (Hatchford Brook Golf Club) having started with a double and then triple bogey. Jason Timmis (Greenway Hall Golf Club) put pressure on the Northern Irishman with a fantastic final-round 67, five under par, to finish seven under but four birdies to just one bogey on the back nine saw Caldwell to nine under and his second EuroPro title. “It has been a long day, but I am absolutely over the moon,” said Caldwell, who wins £10,000 as well as a brand new Motocaddy S3 PRO electric trolley with lithium battery, Bushnell Pro X2 Range Finder and Bolle sunglasses. Caldwell climbs to third on the tour rankings, from which the top five at the end of the season earn promotion to the Challenge Tour. Greg Payne (Camberley Heath / MindSet4Golf) finished third on five under while five golfers shared fourth having finished four under par, including 2016 Amateur Champion Scott Gregory.